For SVENNESS 4.1 we visit Ronse, Belgium, for the GP Mario De Clerq, which is the first stop in the BPost Bank Trofee Series. 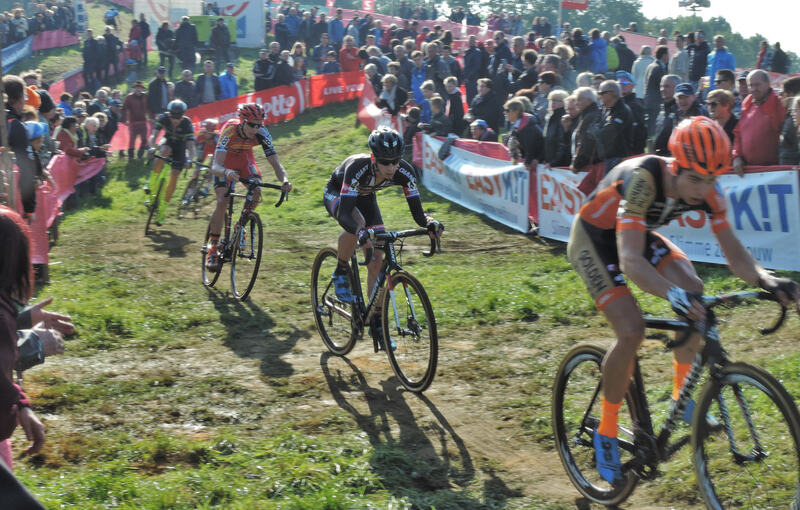 The Ronse track is remarkable for its steep power climbs; fast, tricky descents; and tough run up. Sven Nys won the race the two previous years and was looking at this race as one that he could win. It’s a tough concept to wrap your head around, that Sven has to pick and choose the races he thinks he can win, rather than just show up and dominate. Grappling with that concept is the main themes of this episode. We spend some time looking at off-camber sections and power climbs, but for the most part, this is a story as old as time. Actually, the story is time. And how it doesn’t stop. This episode is sponsored by you. Thanks so much for the support over the past year. Your purchases and contributions make it possible to do what we do at In The Crosshairs. If you’re eager to do even more, please check out everything we have to offer at crosshairscycling.com/shop. We have bells by SpurCycle, toe spikes by Horst Engineering and much more. You can also buy SVENNESS and BAALER shirts at svenness.com. Finally, please check out Skills, Drills and Bellyaches: A Cyclocross Primer. We think it’s a great resource and one that will help you in your racing career. Check it out at www.cyclocrossbook.com. Finally, check out Crosshairs Radio, a cyclocross podcast, available on iTunes. New episodes are released every Tuesday. So far, shows have featured Jeremy Powers, Meredith Miller, Tim Johnson, and more. If you have any comments or questions, please send them to feedback@cxhairs.com. Footage for this episode via Sporza. Music for the episode is all available for sale on bandcamp.com. Fantastic! Thanks, Bill, for all that you do. Bill I absolutely love what you do…I’ve been going to Crosshairs hourly looking for your new stuff. Thank you much! Love it, Love it, Love it. From all MacSvenness fans in Scotland. So much fun to watch,thanks Bill! -You should be named atomic, as this Svenness is.. THE BOMB! Cheers Bill. You can party with Crossers in New Zealand, anytime. Look forward to these and like a kid in a candy store when they come out. BRAVO Professor! I love this happy time of year when SVENNESS is in the air! Keep up the super rad work! Thanks Bill. That was excellent. Skills, Drills and Cyclocross and Svenness are on my christmas list. Always a pleasure to watch – much appreciation for the time that goes into these Bill! I don’t even know how to ride a bike, but I want to learn, find Kevin P, and drop him. Your videos are on fleek. Autumn and ‘cross have officially arrived! We have #SVENNESS! Thanks Bill. Killed it as usual. Brilliant video, full of insight and much appreciated! I for one hope this series continues to be called SVENNESS in perpetuity; I think it has always be as much about svenism — his style of CX — as the man himself. Il s’agit de la manière plutôt que la matière. “Old age and treachery will overcome youth and skill.” Until youth rips old age’s legs off. Man, Wout really wanted that. Thanks for the sick vid! Awesome, please don’t stop doing these!! Love them. I look forward to watching these each time they come out. Probably re-watched each one of them a 3 or 4 times. We’ll done! Thank you so much Bill, these are the best. Can’t wait for the next episode. Good to see SVENNESS back again. The comments are spot on. I really like to see how the big boys tackle the tricky spots like that off-camber downhill or when they decide to dismount for a run-up. Lots of fun to watch especially with the comments about the change in coverage of Sven’s racing. I know these are a lot of work for you to produce, but keep ’em coming and thanks for doing this. It’s been just a little harder to wake up and get hyped on raceday without a Sveness video to keep me company during breakfast. My daughter and I have sat in bed on countless nights jittering with anticipation as we fire up your videos. She’s on the space bar so we don’t miss the narration. She asks every day whether there’s a new Svenness video, and we are saddened when there is not. Though she hasn’t jumped into cx racing just yet, she can analyze tactics and intimate rider strategy better than most 11 year old kids. She asks how I would do if I were in that race, knowing my strengths lie in technical, muddy, mtb-like conditions. I am always honest and tell it like it is, but I try not to use the word ‘last’ first in my explanation. In short, we love every minute you put into the videos you create. Thanks for bringing us the inspiration to ride bikes and dream about being faster and better. I actually rode against Lars VH in Portland this year…. if you can call it that. I was quick to get out of the way when he lapped me the second time. These are one of the high lights of cross season for me! Thanks so much! My life felt empty without Svenness. Now I can feel life and hapiness coming back to me. Thanks for those series! You can’t imagine how much I’ve learned with them… Thanks to it in Mallorca’s cx races I do fight for the podium beeing a 35 year old, full time worker, husband and two wonderful kids dad against young and full time off guys… ???????? Really happy to find a new Svenness. Thanks for your job. Always look forward to these! Please bring more before the end of this season!